There’s more involved with a home inspection than physically examining the property. 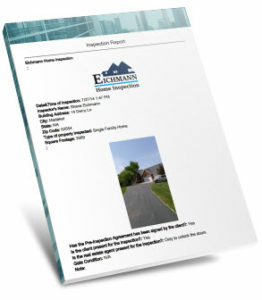 Just as it’s recommended there be a written pre-inspection agreement between a client and an inspector establishing the cost of the inspection and scope of the work before the job begins, the assignment concludes with the inspector issuing a comprehensive written report, accompanied with photographs of his or her findings. In most states, licensed home inspectors are required by law to deliver a report to clients reflecting their findings after completing the physical portion of an inspection. The inspector’s report should be delivered no more than a week after the inspection is completed, and preferably much sooner. There’s almost nothing more important to your reputation and success as a professional home inspector than the quality of the report your client receives after you’ve finished inspecting a home. Clients expect a report that’s thorough, and they want to receive it as soon as possible. Reports should always be given to the client promptly, since they depend upon your findings as to the condition of a property to help them make what is probably one of the most important decisions of their lives. Inspection Certification Associates makes generating inspection reports fast and easy. 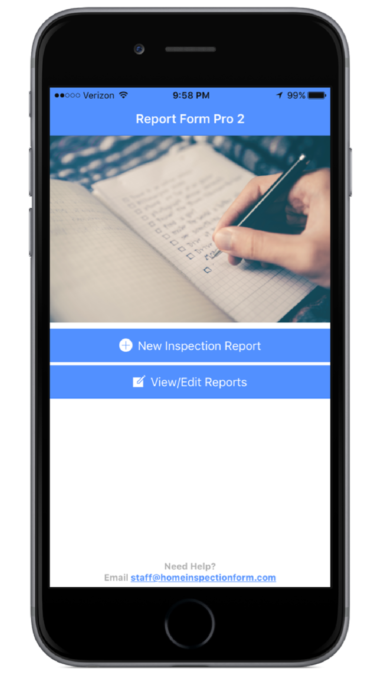 We teamed up with HomeInspectionForm.com to give graduates of ICA’s online Home Inspection Training and Certification Course a means of instantly creating and generating home inspection reports for their clients. 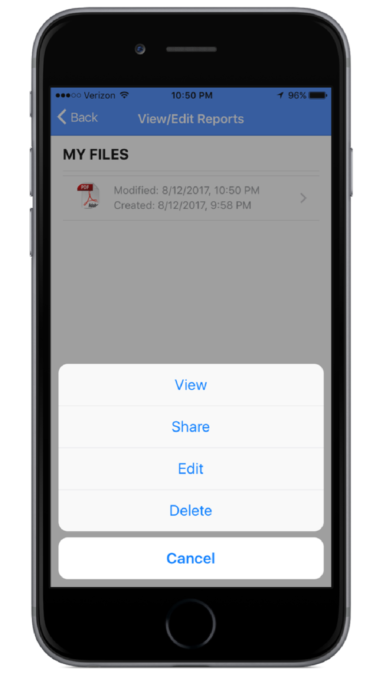 The reporting software package is available for both iOS and Android devices, and includes Report Form Pro 2, which is the industry’s premiere app for generating inspection reports directly from smartphones or tablets. Information can be input manually by typing or through the app’s voice input feature. The software also lets inspectors easily add digital images to the report using a smartphone or tablet’s camera during the inspection. Images are useful since they clearly point out defects or areas of concern, particularly in hard-to-reach areas such as crawlspaces or attics. 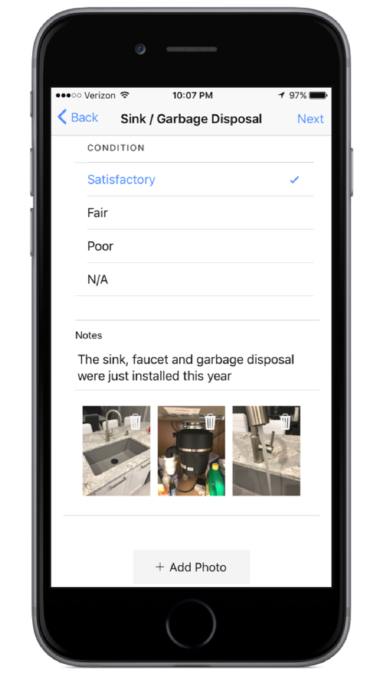 Using Report Form Pro 2, it’s simple to instantly create, view, edit and deliver home inspection reports either by printing or emailing the completed reports to your clients. The Report Form Pro 2 package can also be used to generate reports from desktop and laptop computers as well smartphones or tablets. Both versions of the software allow the inspector to create pre-inspection agreements outlining the scope of the work and establishing the cost of the inspection. If the inspector prefers, or there isn’t a printer readily available, Report Form Pro 2 will also generate blank forms that can be filled out by hand, although issuing handwritten reports isn’t generally recommended. If purchased separately, the Report Form Pro 2 package would cost $400, but all Inspection Certification Associates students receive it free of charge. It’s included in the tuition, and is yours to keep after you complete your training. Unlike most other home inspection reporting programs, there are no renewal charges or other fees. You’ll also receive free, unlimited customer support from HomeInspectionForm.com representatives, who are always available to resolve any issues and answer any questions you may have related to the home inspection report software. The National Home Inspector’s practice exam software, which contains more than 700 questions and normally retails for $75, is also included free of charge when you choose ICA for your home inspection training. 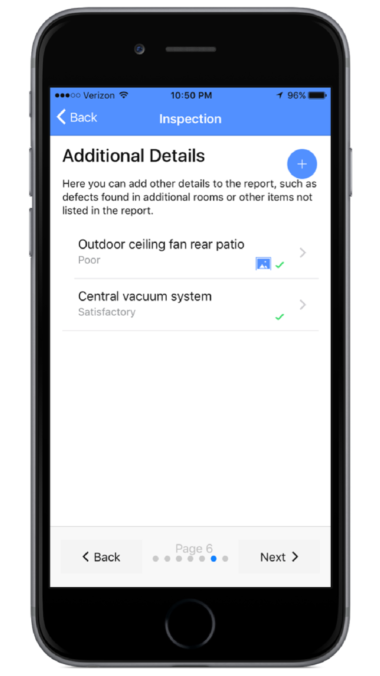 Here’s a brief video demonstration of the Report Form Pro 2 app highlighting its several unique features, along with instructional videos that show how easy it is to generate reports using iOS or Android devices with this outstanding home inspection software. The inspector’s report should also include maintenance recommendations, along with safety suggestions. Using Report Form Pro 2 makes is easy to include these, as well as any addition information the inspector feels will be helpful to the client. Inspection Certification Associates makes understanding how to inspect homes and convey informational reports easy. Find out more about the home inspection classes available online or in your area today, and feel free to contact us with any questions you may have.